The historic center of Dieppe is quite small and you can walk to most sights. The Port of Dieppe, with its mix of fishing boats and pleasure craft, is charming and pleasant to walk around. Starting at the port, you can walk to the major sights (map). But first, just take in the port area. Surrounded by historic buildings (many of which are home to restaurants), it's a lovely seaside town with nice views of the surrounding falaises, or cliffs. From the port, walk down the narrow streets toward the large church, the aptly-named Église Saint-Jacques (the scallop shell is a symbol of Saint James/St-Jacques and is also used to refer to scallops in French). The Église was built between the 14th and 18th centuries and shows a variety of styles. From here you can walk down the Grande Rue, or Main Street, and admire the architecture. The Grande Rue will lead you to the Puits-salé, or salty well. Although today's well is merely symbolic, historically there was a salt water well at this spot. Today it's where many streets come together, the heart of town. Continue a bit farther and you'll come to the Château-Musée, or Chateau Museum, high on a hill overlooking the town and with a view to the sea. 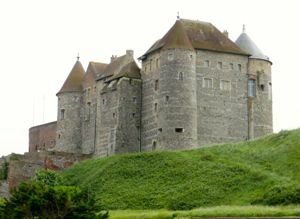 Like the church, the Château was built over a number of centuries, and parts of it date to the 14th century town walls. After much restoration, it today houses a museum that focuses on maritime history and the ivory trade. Its collection includes over 1000 ivory objects carved by tradesmen from Dieppe starting in the 15th century. Just down the street from the Château is the Mémorial du 19 août 1942, commemorating the Canadian commandos who tried valiantly to force back the Nazis. Many lives were lost in this effort, and the ties between Dieppe and Canada were strengthened. A plaque in the Square du Canada honors that effort. To the northeast along boulevard de Verdun you'll see La Porte des Tourelles, just to the left of the Hotel Mercure Dieppe La Présidence. This is the twin-towered medieval portal through which Les Filles du Roi, those hundreds of young "daughters of the king," embarked for Canada from 1663 to 1673 to swell the population of the French colony there. To return to the port, walk along the beachfront. At its westernmost end is a large spa and swimming pool. The beach itself is shingle—no golden sand here. But there are playgrounds and areas to sunbathe and swim. The waterfront street is home to a number of hotels and restaurants, as well as some elegant private homes. 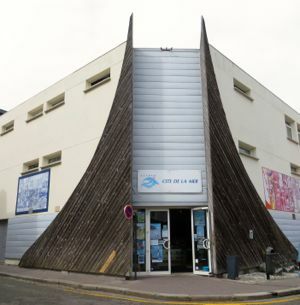 At the eastern end, turn inland to the Estran-Cité de la Mer, an Aquarium and maritime museum. In addition to the aquarium, the museum includes exhibitions on shipbuilding and technology; the fishing industry and fishing techniques; and the evolution of the lovely cliffs and surrounding geology.